Sub: - Recommendation of 7th Central Pay Commission — Decision relating to grant of Additional Allowance to Running Staff. 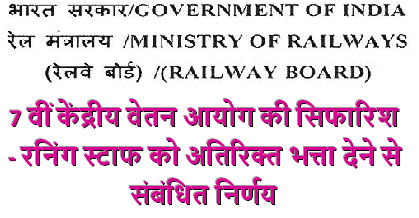 Please refer to item 3 of Annexure ‘B’ of Ministry of Railways' letter No. PC-VI/2008/1/RSRP/1 dated 11.09.2008 (S. No. PC-VI/2 & RBE No. 108/2008) circulating schedules of revised pay structure for running staff effective from 01.01.2006 and letter No. PC-VI/2010/I/RSRP/4 dated 02.11.2010 (SI. No. PC-VI/234& RBE No. 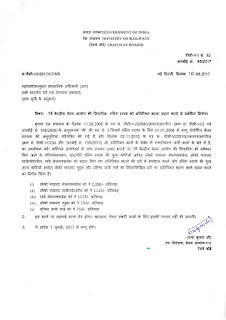 159/2010) regarding clarification on Additional Allowance. Consequent upon the acceptance of recommendation of 7th Central Pay Commission on Allowances by the Government with certain modifications, the President is pleased to revise the rates of Additional Allowance granted to certain categories of Running Staff viz. 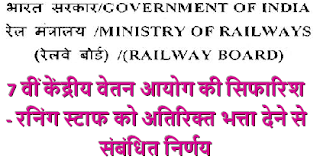 Loco Pilot Mail/Express, Loco Pilot Passenger/Motorman, Guard MaiVExpress and grant of Additional Allowance to some other categories of Running Staff viz. Loco Pilot Goods and Sr. Passenger Guard at the following rates.